Kathy Green Author: IT'S NOT ABOUT POLITICS! I'm pretty much over the disgusting name calling and back stabbing election we just finished. Tennessee elected a new governor and I must give him credit. He did not run one negative ad about his opponent. 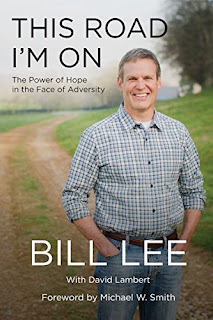 Bill Lee kept it about what he has done and will do for Tennessee. It's one of the reasons I voted for him. So what's all that got to do with books? Well, Bill Lee has written a book that is not one thing to do with politics or government. It is the story of his life. The sweet, the sad, the tragedies and the mountaintop (literally) experiences. This Road I'm On: The Power of Hope in the Face of Adversity is a heartwarming, can't put it down book. Please add this one to your to read list. You won't be sorry. From his chewing tobacco on the farm as a boy, the loss of babies and his first wife, to a climb to the top of The Grand Teton with his 16 year old daughter, you will love this book. Keep a box of tissue nearby, you will need it.